Running has never been more popular. Whether driven by a desire to lose weight, keep fit or just an irrepressible passion for running, each year, an estimated 60 million people around the world tie their laces and hit the pavement. Sadly, an estimated 70 per cent will go on to suffer a running-related injury. Today, that statistic could be about to change, as two running enthusiasts and entrepreneurs from Australia bring their Bionic Runner to the crowd-funding platform Kickstarter. “Four years ago, our vision for an injury-free running community led us to design and develop the Bionic Runner – the world’s only high intensity, non-impact, running-specific trainer,” says Steve Cranitch, co-founder of Run4, the company behind the Bionic Runner. “Every bit as tough as running, yet without the risk of injury, we believe the Bionic Runner will change the way athletes and amateur runners think about their training,” he adds. 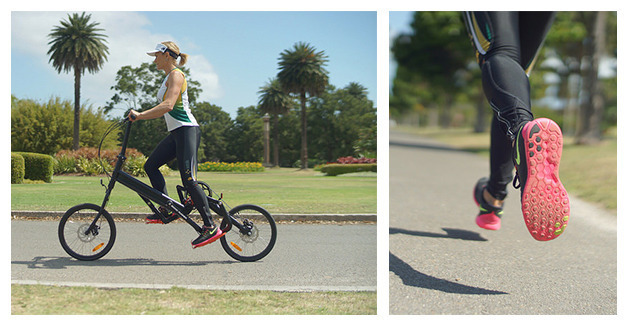 The Bionic Runner is the only non-impact fitness trainer to mimic the natural gait and timing of running. “We discovered that running was a four stage process of leap, recovery, impact and drive. The existing cross trainers were all elliptical in nature or step machines. None captured the motion a runner’s leg makes when they move,” explains Dr Henry Thomas, Chief Technical Officer and Co-founder of Run4. “Unlike an elliptical trainer, the Bionic Runner has a unique patent-pending 60% swing and 40% stance phase timing, which guides the foot along the path of a mid-foot running gait,” he adds. The result? You not only look and feel as if you’re running, you engage the same muscles as you would pounding the pavement, too, separating the Bionic Runner from any cross trainer on the market. Also unlike an elliptical cross trainer, the Bionic Runner has a substantial 2.5g pedal reaction force at toe-off, which drives the rider’s hips into the air, simulating the leap characteristic to running – that momentary sense of having both feet off the ground, even though the feet remain in contact with the pedals. Thanks to its non-impact closed kinetic chain, with the Bionic Runner, you can eliminate the risk of injury from impact fatigue and joint over extension – the two most common causes of joint, tendon and muscle-related strain injuries. This means you can push yourself harder in training than you normally would running – increasing fitness, strength and endurance so that, on race day, you’re not only fit, but faster. The claims made by the team behind the Bionic Runner are backed by research published in peer-reviewed journals. Collected over the last year, data published in the Australian Journal of Strength and Conditioning shows that, whether using the Bionic Runner for interval, Fartlek, tempo or hill sessions, the runner offers the same intensity as conventional running – without the risk of injury from over extension or impact fatigue. “We feel confident concluding that the sensation of high intensity exercise using the [Bionic Runner] is more satisfying because the swing and stance timing feels more like running,” the Journal states. 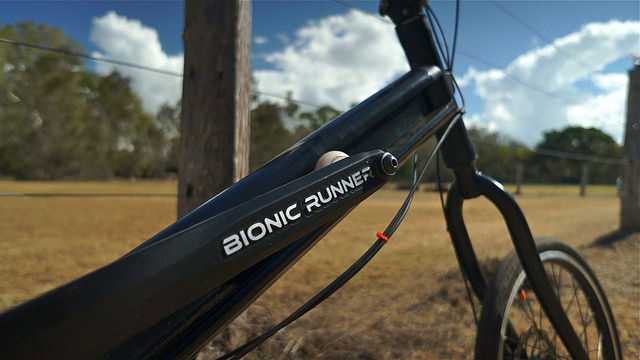 The Bionic Runner will be available for purchase on the crowd-funding platform Kickstarter from December 1. A limited production run of 500 Bionic Runners will be available for the discounted earlybird price, after which the machines will be available for the standard price.